Remi DePape, born on a farm two miles west of Swan Lake, was the eldest son of Charles and Marie DePape. In 1936, Remi married Angele Lombaert. They farmed in the Mariapolis region, and in later years, moved to Somerset. Remi raised and showed Belgian Horses, as well as Shorthorn cattle. Public recognition of his experience and knowledge led to his being sought out as a judge for the local fairs. Poor health forced him off the farm, and he became an assistant grain buyer for the UGG. In 1951, he purchased and held, for seventeen years, a Massey-Harris franchise in Somerset. At the same time, he built a feed mill to provide balanced rations for the livestock of the area. Always ready to promote the cause of agriculture, he helped the members of the Somerset 4H Seed Club. In 1962, Somerset was incorporated. Remi was elected the mayor and served in that capacity for twenty-one years. He guided the town through the construction of water and sewage systems, the planning and construction of a Community Hall, the building of a Senior’s Home, and the opening of a friendship centre. For eleven years, he served on the local board of the Manitoba Housing and Mortgage Authority, and made available homes to low-income families. When he became a director of the Pembina Valley Development Corporation, he realized the effect of the abandonment of the rail service. Remi helped to organize the Branch Line Association and served as its president. He spent much time studying the Morris-Hartney railway line: accumulating data, attending meetings, and presenting briefs. His efforts and leadership were commendable. Remi DePape has contributed a lot to his community. Keenly interested in health and welfare, he became an active member of: the Lorne Memorial Hospital Board, the Recreation Commission of Somerset, and a church trustee. He helped the Curling Club as: secretary, carpenter, construction superintendent, and drawmaster. 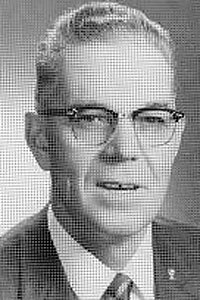 He was founding member of the Mariapolis Credit Union, served in many executive positions within the Order of the Elks, and was a director of the Manitoba Agricultural Hall of Fame, and the Union of Manitoba Municipalities. His dedication and uncompromising integrity has earned him the respect of all who know him.